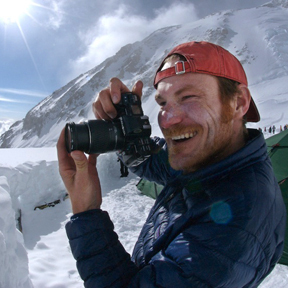 Ted Reckas at 14 camp on Denali, by Kyle Christenson. A picture worth 1000 words. That’s what they say right? Some are worth several thousand; pictures tell powerful stories. As I shoot, I realize many images have a story behind them you cannot know just from looking at the photo. And knowing those stories, or what the photographer was thinking, often makes photos much more interesting. Here I share the stories I find as I go along shooting, and writing the stories that lie underneath. Hopefully they will show you something you’ve never seen. Or something you’ve seen but not thought about much. Or maybe something you didn’t know was happening. Do you know anything else about Julita Jones? I’m looking for one of her prints ‘Escape from the zoo’ and the website ‘cox’ does not work any more. Sorry, I haven’t kept up with her recent work, but have seen her around town lately.